Former Brazilian President Luiz Inácio Lula da Silva has been convicted on corruption charges and sentenced to nine-and-a-half years in prison. Lula, widely considered one of Brazil’s most popular political figures, is the front-runner in the 2018 elections. The White House is in crisis mode following revelations that Donald Trump’s own son embraced an apparent effort by the Russian government to peddle information incriminating Hillary Clinton in an attempt to help Trump win the presidency. In a new interview with Reuters, President Trump defended his son and said that he himself did not know about the meeting. 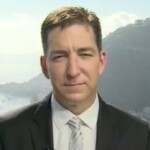 Pulitzer Prize-winning journalist Glenn Greenwald, co-founder of The Intercept, notes that Democrats have had similar entanglements with foreign governments. The parent company of The Intercept—First Look Media—has announced that it will provide support for the legal defense of Reality Leigh Winner, the NSA contractor who stands accused of leaking a top-secret document to The Intercept. She faces up to 10 years in prison, if convicted. Winner, who remains in jail, was charged for allegedly leaking a top-secret document showing how Russian military intelligence attempted to hack into several states’ voting infrastructure. The Intercept’s handling of the story faced widespread scrutiny. The Department of Justice claimed in an affidavit and search warrant that it caught the leaker in part by actions taken by The Intercept.